SDN began as an idea that the network’s data plane and control plane should be distinctly separated. In essence, this would separate the hardware from the software, breaking the historical model of vendor-specific platforms and proprietary control plane implementations. The realization of such an architecture would unleash greater programmability, innovation, and agility from the network, ultimately holding the promise of lower costs through hardware and architectural simplification, and operational savings through commonality of control. Today, however, the definition of SDN is no longer quite so simple. The term “SDN” has expanded to almost mean “anything software can do to improve the value of a network,” becoming a rallying call for change in networking that stretches from access to core, from user to data center, from mobile to fixed networks, and through virtually all layers of the traditional OSI model. Because of these somewhat disparate ideals, it’s become increasingly difficult to speak generically about SDN and be assured that everyone is speaking the same language. But the lack of a clear uniform SDN definition is not as troublesome as it may sound, thanks to the ability to identify a few general themes. By further analyzing these themes we can then generally categorize them into one of three what I like to call “factions”: Operators, Pragmatists, or Purists. Operators want to solve the age-old operational and multi-vendor management challenges the industry has faced for years. This camp focuses on the network operator’s side and seeks to solve the traditional problem of multi-vendor management and service assurance. They tend to recognize the growing trend towards “openness” and see it as an opportunity to build upon existing solutions. Ultimately, the Operators view SDN as holding the promise of true, multi-vendor management with enhanced service assurance. 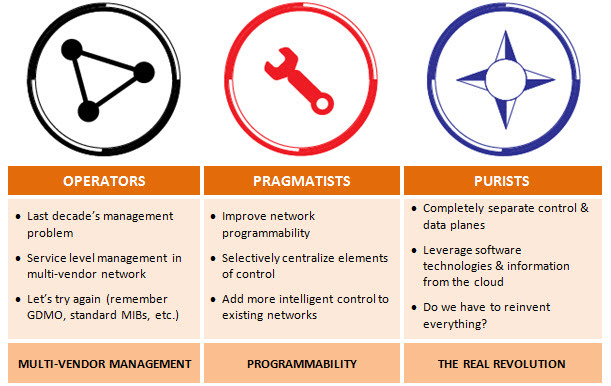 The benefits of SDN resonate with Pragmatists, but they don’t come with a prescribed method for achieving them. The Pragmatists are hybrids, those who believe that it’s time for things to change but who also recognize the significance of the potential impact to existing solutions. They believe that proven—or in a few cases newly “open”—interfaces communicating with existing distributed control planes still have a place in the network. This belief then reinforces their desire to create a flourishing ecosystem of value-add software applications through the use of proper abstraction and northbound interface modifications. The Purists stay true to the original definition of SDN. The Purist camp adheres to the true definition of SDN as it originated and they generally believe in the strict separation of the data plane from the control plane, implementing OpenFlow as an open southbound protocol to achieve this. When fully and correctly implemented, the Purist definition of SDN represents the true revolution in networking—a defining moment in networking history if or when it can be truly achieved. Ultimately, SDN means all of these things and more. There are clearly other factions, beliefs, and ideals that fit into multiple categories; however, these high level classifications typically capture the majority of existing opinions in the market today. The truth is that a precise definition of SDN isn’t necessarily as important as a clear understanding of the problems one is trying to solve and the acceptable risk vs. reward factors an operator is willing to accept. A comprehensively defined SDN solution can address all these themes and should enable the user to migrate from one to another as their business needs dictate. So, what is SDN? It’s both an idea and an ideology, representing a significant inflection point in the networking industry—and it’s unlike anything we’ve ever witnessed before. Now it’s your turn to weigh in. 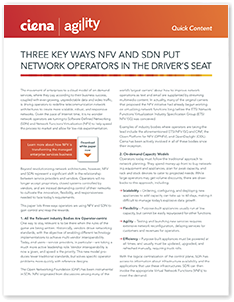 Do you belong to any of the three SDN factions? Do you identify with a group not already discussed? I’d like to hear your stance on the factions of SDN; post your thoughts in the comments section below.